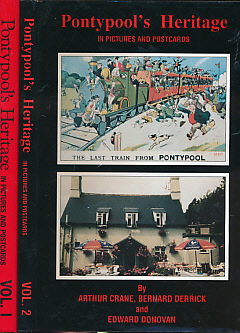 Barter Books : Crane, Arthur; Derrick, Bernard; Donovan, Edward : Pontypool's Heritage in Pictures and Postcards. Two Volume Set. 260 x 180 mm (10 x 7 inches) - vii, 137pp; vii, 197pp. Black and red hardback cloth covers. VG: in very good condition with dust jackets.